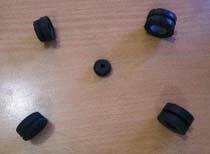 We are renowned as an eminent Rubber Grommets Manufacturer, Exporter, and Supplier, based in Tamil Nadu (India). The Rubber Grommets, offered by us, are used for reinforcing the hole as well as shielding something from the sharp edges of the hole. The Rubber Grommets are provided by us in varying sizes and shapes, as per the industrial needs.